It's been nearly 6 months since my last blog post and I would like to say I haven't blogged because I have been ultra busy but that's not the case. In fact I have had lots of personal problems that has meant I haven't photographed my projects, let alone sit and write about them. I'm going to try and catch up with what I've been up to in the next few posts and hopefully start posting regularly again. After all, the crochet blogging community is an amazingly inspiring one and I loved being a part of it. So here's some of what I've been up to the last six months. Working on my CK blanket - just 9 squares until the edging!! So that's all the photos I've got from the last few months. Once there is a bright, sunny day I'll whip out all my FOs and WIPs to show you all. Thank you to my loyal 7 followers who haven't abandoned me in this intermission. I spent the last few days flat hunting back in Bristol and whilst I was there I found time to pop in the Cath Kidston shop near the University. Although I didn't buy anything (I'll wait for the sale!) I did snap a few pictures to show you as I know some CK fans don't live near one of her stores. Just click on the photos to make them bigger! From the outside you can see the front of the shop focuses on bags. I keep spotting people all over bristol using CK bags and I have one of my own. The picture below was just one of several displays sporting bags of lots of different sizes, shapes, colours and prints. I love that some of the display cabinets were old wardrobes painted blue or pink and so were the period features of the building such as the pink archway you can see on the right of the photo below. After I walked past the bag displays I found myself at the till with baby products on my right, followed by rails of clothes and shoes. I couldn't get any good pictures of these as it was too dark. I did get a snap of the nightware and toiletries display below. Everything was very expensive, just as you would expect from Cath, but browsing these delights just made me so happy and really cheered me up after having a rather dismal morning. Next a ascended a small flight of steps and was greeted by this pretty table setting. Next to that was a gorgeous array of teatowels and aprons that begged to be tried on. If I had this stuff in my kitchen I'd find any excuse to wash dishes!! The next photo was my favourite corner of the entire shop. I lust after CK bed linen and when I am earning my own money this is at the top of my list to spend my first paycheck on. I really, really wanted to buy something at this point of my shopping trip but at £16 a cushion cover it would be a waste of money when I can make one myself. Now onto the crafty bits. There were sewing boxes, rolls of ribbon, fat quarter packs, books etc but they were so over priced for what they were I couldn't justify getting anything. And there were sooo many rolls of the most divine fabrics. I stroked them, I moved them around and eventually my boyfriend had to drag me away for a flat viewing but I could have spent hours in this shop. If you are ever in Bristol you should try and check it out. Also, it's near a homeware shop called Guild I would highly recommend. And if that wasn't enough CK for you, I spotted a small store in St. Pancras train station on my way through and took a quick detour to check it out. It had pretty much the same stuff as the Bristol store but was a lot smaller. I did spot these cute teddies, all in a row, guarding a basket full of sweet plushies. So I hoped you liked shopping with me today and that you'll be back for more. I probably won't be able to post the pattern I promised you last time until late next week because I have exams but I have not forgotten about it. I can't believe its been more than a month since my last post! Now I have a camera and I'll be moving into my new place soon my posts should become more frequent. The picture above is a beautiful pink/purple orchid on my mum's kitchen table. I've loved watching the petals slowly unfurl every day whilst I've been studying. Even though I've been busy I've fit in a lot of crafty time and over the next few posts I'm going to try and bring you up to date. If you check this post from the wonderful Lucy of Attic24 you can see two granny blankets at the top. This was my inspiration for my "Summer Granny Blanket". I wasn't that keen on the Sweet Flower blanket but her Blanket Statement is beautiful! I've tried this pattern out a coupla times with Rico Essential Cotton DK and James C Brett's Kool Kotton but I never really loved what I was creating. It just didn't match up to Lucy's creations or what I imagined it would be like. I was thinking about having another go with some Stylecraft Special DK until I saw Debbie Bliss Prima reduced to £1.98 here. If you haven't visited Black Sheep Wools yet you should. They have some fantastic deals sometimes, including some Sublime Cashmere Merino Silk for just £2.50. I love finding yarny bargains on the internet. So anyway back to the yarn, it's 80% bamboo and 20% merino and its is lovely to work with. It has the beautiful sheen pure bamboo yarns have but is less slippery and is warm and squidgy just like merino. It is definitely a blend I will use again. I picked up a few extra shades on eBay from this brilliant seller for £1.75. So now I have 21 shades to play with. After I made some squares I found two of the colours just werent blending in with the rest. The Coral 32 and Bright Pink 26 were just too bright and almost garish. So I ripped back a few squares and now I am so much happier with it. I don't know what to do with this leftover yarn, maybe another Amineko or some wrist warmers for a gift? I'm sure I'll find a use for it. And as of today my total square count is 7/9 large and 20/64 small. I did want to make it the same size as Lucy's Sweet Flower Blanket but I don't think I'll have enough yarn. So, what do you think? I am so completely head over heels in LOVE with these beautiful grannies. I love crochet. I really really do and it has been my only craft for the last 18 months, but since I have been staying with my mum I have had the urge to sew. Now I don't want you thinking that my mum is a homely woman who gets out her latest piece of embroidery because that is far from the truth. She has big ginger curls and can often be seen wearing floaty dresses. She is a Buddhist and used to be a medium. She believes in angels and collects ornaments of fairies. She hates gardening, cooking and generally anything crafty. So with 4 younger siblings and various family members/partners/friends/pets this is a pretty chaotic house at times, not really an inspiring environment and I'm not quite sure why I absolutely have to do some patchwork right this minute and I couldn't possibly wait for 3 days for the fabric to be delivered. 3 days?! I want it NOW! Then when it finally arrives and I'm literally jumping up and down making high pitched screeching noises. I'm sure my family think I've gone completely bonkers! So would you like to see some of the fabric I got? I really really want to share it with someone who loves it just as much as I do. I wish these photos showed the vibrancy of the colours because they make me so happy just looking at them and thinking of all the wonderful possibilities. Perhaps a cushion, a quilt, how about a patchwork apron? Ok so here is the first thing I bought - Patch! by Cath Kidston (and my new crochet book I haven't blogged about yet). I really love Cath Kidston designs. This book is so inspiring and well worth the £10.50 I paid for it. It came with a neat little set to make the bag/cushion on the front and was a great beginner project. I haven't quite constructed the cushion yet because I don't have access to a sewing machine. These are some really handy precut squares I got from eBay. I would definitely recommend here and here. I bought some larger cuts of fabric too. This shop is bargainous - just £1 for a fat quarter and £1.50 for a 1/2 metre!!! I intend to make some lovely shabby chic patchwork cushions and an apron. I was also inspired by this amazing cushion so I started making my own hexagons to sew together. They are quick and easy to make. I bought the templates here and they even came with some handy instructions and one with fabric already tacked onto it. And my favourite - a glorious roll of Amy Butler fabric I got as a free gift with my subscription of Mollie Makes (for UK only, find out more here). I even waited 2 WHOLE DAYS so I could photograph the moment when I unrolled it to share with you. Are you ready for the best bit? It's going to be a colour explosion - get your sunglasses! Isn't it just magical? I am in love. I really really am. I can't wait to get show you the finished objects. So I hope you enjoyed this colourful, fabricky post just as much as I did writing it. I would love to read your comments and know that I'm not the only one who gets excited over crafty bits. Do you like them? I really LOVE them. The colours in this photo are a little off but they still look awesome. I can't wait to get hooking some more. The pattern is so fun, easy and the colour changes look fantastic. I don't know how I'm going to join them - maybe slip stitching with the wrong sides together or a sc join in white or maybe denim blue. Any ideas? So, just in case you feel like hooking up your own Granny Wheel Squares I've written down how I made them. I hope Lucy doesn't mind me writing her pattern out for you to use! I'm using US terms here. Just to reiterate - this is not my pattern. Round 2 - Join new colour to any ch 1 space, ch 3 (counts as 1 dc) dc in same space, ch1, *2 dc in next ch1 space, ch 1* repeat 11 times, ss to 3rd chain and fasten off. Round 3 - Join new colour to any ch 1 space, ch 3 (counts as 1 dc) 2dc in same space, ch1, *3 dc in next ch1 space, ch1* repeat 11 times, ss to 3rd chain and fasten off. Round 4 - Join new colour to any ch 1 space, ch3 (counts as 1 dc) 3 dc in same space, ch 1, *4 dc in next ch1 space, ch1* repeat 11 times, ss to 3rd chain and fasten off. I also added a round of sc in the same colour as Round 5. PS. I'm getting my camera soon so I'll be posting more often then. When I saw Littlecottonrabbit's "me old china" blanket I just knew I had to have one! 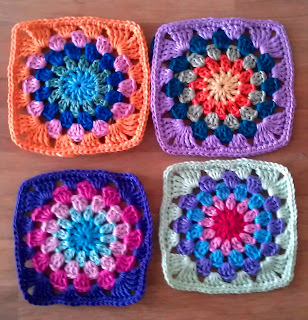 I love granny squares and the idea of being inspired by your china really appealed to me. I found two Cath Kidston mugs my mum gave my for christmas and thought the colours would make a brilliant blanket. It's Sublime Extra Fine Merino 4 ply purchased from here and here for £2.49 - £3.15. I have never crocheted with 100% wool before as I usually prefer acrylic, cotton or cotton blend yarns but the colours were too perfect not to order. It's also more expensive than I would usually buy but the quality of the yarn is brilliant. It's not smooth but its so soft, bouncy and warm. This will definitely be a winter blanket. I was unsure of including both Redcurrant and Peeptoe because they are both quite similar. I played around with the colours and decided to include both but not put them next to eachother. Isn't it beautiful? I love the vintagey feel and the colours complement each other beautifully! Because I'm using 4 ply yarn on a 3.25mm hook the squares are quite small and I'll need 14 in each row to cover a double bed. I'm also using a join as you go method different to Lucy at Attic24 that I made up myself and haven't seen on the internet before so I'm working on a tutorial for that. I've been a really naughty girl and haven't been weaving in my ends as I go. The photo above fills me with dread but I know all those hours of work will be worth it in the end.